The following sermon was preached by Rev. Kurt Lantz in the seminary’s Martin Luther Chapel for the divine service in celebration of St Michael and All Angels, 29 September 2014. The text is Daniel 10:10-14; 12:1-3. Belief in angels is alive and well in our society. Despite the efforts of rationalists and evolutionists and atheists, who have been able to successfully combat belief in a bodily resurrection, a six-day creation, and a divine moral absolute, those who eat up what spews from their mouths inexplicably digest a belief in supernatural beings at work beyond the realm perceived by our five senses. It seems that it is okay to believe in the supernatural, as long as you don’t believe in a god. What happens to angels in a belief system where there is no god? First of all, you have to explain how they came to be, and people have been taught that everything comes to be by evolution. And so it is that the existence of angels is explained by an evolution that continues beyond the grave. The dead die and become angels. Children die and transform into cherubs. Parents and older siblings pass away from this life and yet live on to watch over us who are still trapped on this earthly plain—our guardian angels assigned to keep an eye on us. And so we progress in our false Angelology to define what it is that angels do. What do angels do in a belief system where there is no god? They do whatever we want them to do. It is no longer the LORD’s bidding they answer, but ours. They are only around when we want them to be here. They only see what we want them to see. They only interfere when it supports our idea of what should happen—to avert a car accident in order to save our lives, or direct the fall of a tree so that it narrowly misses our home. Otherwise the angels stay out of it. They do not transgress the bounds of our will or the limits of our experience. But what if there is a god, an Almighty God, who created not only heaven and earth, but the angels and us? Then we would have to submit to what God has revealed about these created spiritual beings, regarding where they came from, what they do, and whose bidding they answer. We don’t want to submit like that. It is one thing to be submissive in moral behaviour (we struggle with that enough on its own), but to submit in areas of theology and belief, is asking too much for anyone, isn’t it? After all, don’t we all want to be angels, and angels free from submission to a higher authority? Don’t we want to be the ones to engage the demons in battle, to be in control of the front lines of the war that is not against flesh and blood? Don’t we want to be the ones to deliver that one-time Gospel message that will change everything, that insight into eternal truth that has never quite been expressed this way before? Don’t we want to be a Michael, a Gabriel, a Raphael, an Uriel? And we want it all without submission to the LORD of hosts. We don’t want to risk being assigned some menial task, aggravating the junior tempter Wormwood when we could be the one to bring about the downfall of his exalted uncle Screwtape (C.S. Lewis, The Screwtape Letters). Why risk being sent as an errand boy to some obscure young girl in the north country, or a few winy women in a cemetery, when we could choose where and when to appear, perhaps above the altar at Redeemer Lutheran Church in Fort Wayne or atop the steeple at Ulm Minster in Germany. We could deliver that divine annunciation that would re-Christianize, no, re-Lutheranise Germany, instead of twittering about on the internet or preaching to only a few dozen people from a plywood pulpit. Ah, but then we would be acting against the very thing which we prayed in the Collect of the Day. The Collects of the Church help us to keep on track. The everlasting God has “ordained and constituted the service of angels and men in a wonderful order.” By submitting to the Collect, formulated on the teaching of Scripture, we are submitting as the Bride to her Bridegroom, in order to keep that wonderful order ordained by an Almighty and Omniscient God who does in fact exist, who created the angels and directs their service so that everything does not devolve into chaos. It is a well co-ordinated battle being waged by the heavenly host—one that serves the furtherance of the Gospel and has throughout the ages. As Michael was dispatched so that the heavenly messenger could bring his news of consolation to Daniel, so the unseen warriors continue to battle back the demons that would derail the coming of the good news to those in need, to such an extent that it is a grave matter to interfere with the evangel being delivered to even the littlest in the kingdom (Matthew 18:10). 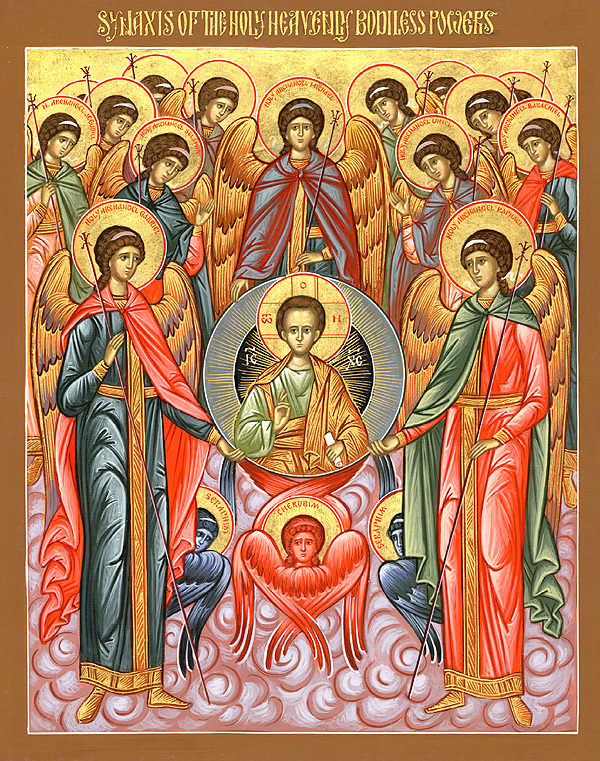 Fashioned by Almighty God at the creation of all things as immortal heavenly creatures, these messengers bring the Word of the Lord to His people, announcing forgiveness and deliverance through the incarnation, resurrection, and return in glory of the One who accomplished even what they are unable to do. They are the LORD’s soldiers, fighting for the kingdom of heaven, fighting for us, protecting the people of God and escorting the message of salvation to young and old. These angels lead in the symphony of praise sounded forth by all of God’s creation. With us they laud and magnify His glorious name forever. Without these obedient servants to the Almighty where would we be? We would not ascend to the heights of spiritual grandeur that we imagine for ourselves. We would not be able to take their place or to do the job that they have been assigned. Without angels in the wonderful economy of God’s created order the Gloria in Excelsis would never sound forth, for it would not have been announced to the shepherds on that night when now all Christians sing. Without angels the women would have left the tomb in despair and the apostles would have been wondering who stole the body of Jesus, for which they were being framed. Without the angels they would have been left staring up into heaven at His ascension and paralyzed by the thought they might never see Him again. Without angels the little children of the kingdom would be constantly assaulted on every side with every demonic device within imagination and beyond. That is how it would be if there were no angels, or no God to order their mission. That is how it would be if we became angels and were left to decide for ourselves how we would go about our skirmishes against the old evil foe. But that is not how it is. There are angels and they work in a wonderful order orchestrated by the Creator of heaven and earth and all they contain. And as a result the good news of salvation has come to us. In our time of despair and in answer to our prayers the angels have ridden shotgun to the Good News of forgiveness and salvation being dispatched to us. They have penetrated every ambush that the evil one has put in the way to prevent the annunciation of the forgiveness of your sins. They will continue to get the Gospel through until the day of our climactic deliverance when the earth gives up her dead and the faithful shine with the brightness of the sky, not as angels, but as the redeemed of the Lord, risen to everlasting life, and shining like the stars for ever and ever.